What: The easiest Pancakes you’ll ever make, in personal, kid-sized batches. When: When you’ve got ripe or overripe Bananas or just feel like making your little one the simplest and most delicious breakfast ever. Why: While I am generally skeptical of any recipe that uses the word “magic” in its title, I thought the deliciously light breakfast you see below was deserving of such a designation. With just one more ingredient than it takes to make a humdrum bowl of cereal, you too can have Magic Pancakes. Trust me, you’re not going to believe how well these work. 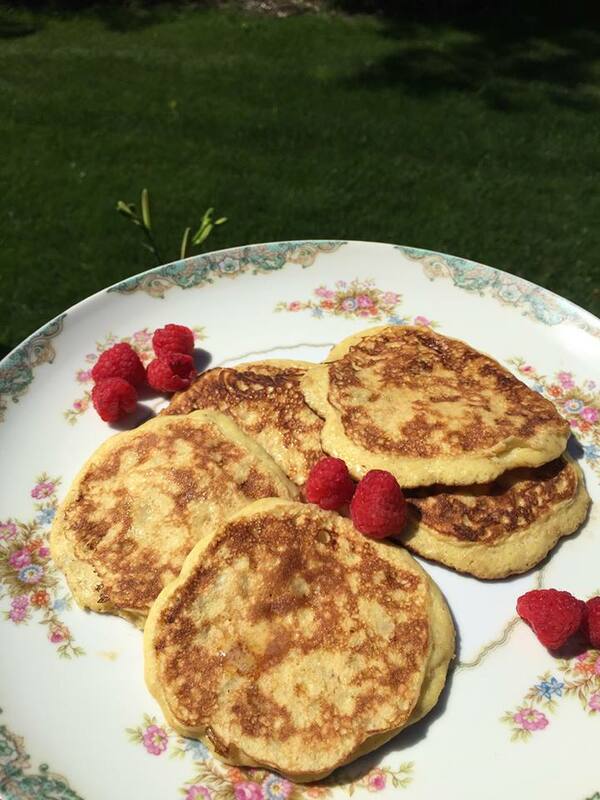 How: Banana is the secret ingredient giving this light as air pancake it’s heft without adding heaviness from extra carbs. Something tells me you’ll be stealing these off your toddler’s plate. You can blend the three ingredients together in no-time flat and you’ll have one batch of just enough for 1/5-2 toddler servings or one modest adult-sized breakfast nosh. You’ve got nice ripe or even overripe Bananas that would otherwise go to waste (even slightly underripe Bananas will work). You’ll be a believer too. Enjoy! Mash Banana in a bowl, add beaten Egg and Flour. Blend – this can remain a little lumpy and it will still turn out fine. Pour batter onto a hot skillet (you can lightly butter or spray it if you prefer) and flip carefully when Pancakes begin to get golden. Finish and serve. What: Delicious Waffles that help get healthy veggies into your kids. Also, since we are family dealing with several food allergies, these have a reasonable amount of Egg in them, so they’ve been a useful vehicle to get our son to, slowly but surely, tolerate it in a baked format. What makes these extra wonderful is that they are free of added sugar and just one Waffle is quite filling so they make for a comparatively low-calorie adult breakfast. Just pop in the toaster or toaster oven. I have to thank my coworker, Lara, for sharing her recipe adaptation of these tasty and very satisfying waffles. I admit it – I love them as much as my son does! When: Whenever you’ve got about 30 minutes to make a big batch – 6 waffles, just over three minutes each on the waffle iron. Why: Because you don’t want to miss a chance to sneak more nutrients into the foods your kids already love. These Waffles freeze well and can be toasted up from frozen in just a minute or two. They’re a great portable work breakfast for moms and dads on the go! How: All you need is a preheated waffle iron and the below, easy to find ingredients. If you cannot find BPA-free Canned Organic Sweet Potato, you can always prepare and mash your own Sweet Potato ahead of time. Alternately, canned pumpkin makes a great substitute. Preheat waffle iron. In large bowl combine Sweet Potatoes, Butter, Egg White, Milk. Beat well with a whisk until well blended. Add both kinds of Flour, Baking Powder, Salt and Vanilla Extract and Cinnamon. Grease waffle iron with spray or Butter and pour batter on. Cook until golden, crispy, and easily removable from the iron. *See note below. *Note: We had the best results cooking these longer but on lower heat on the waffle iron- Exactly 3 minutes and 30 seconds on a moderate heat – (position 3 on a Cuisinart Iron). Cut Waffles into quadrants for your little ones, serve and enjoy!! !